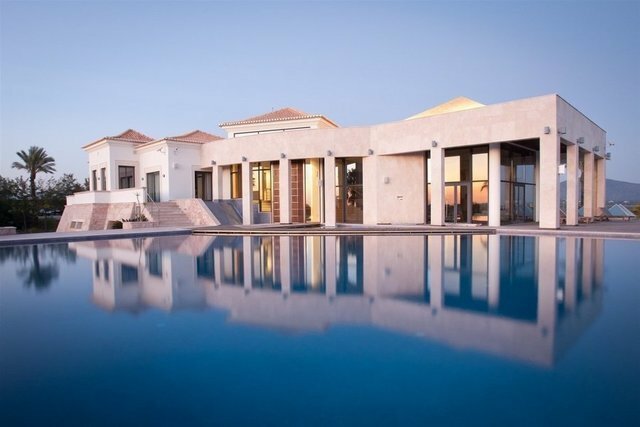 Imposing villa located in the heart of the Algarve, with 360 degree views over the coast and the Algarve mountains. An old windmill has been renovated and integrated into the modern architectural lines of this fantastic villa, making it the perfect place to enjoy the surrounding natural environment but with all the equipment and social amenities you can imagine. The floor of all social areas is Portuguese natural stone, including stairs, circulation areas and garage, and as we enter this wonderful villa we are welcomed by an immense entrance hall that allows access to the magnificent living rooms and open-plan dining with ample panes for the leisure area and outdoor pool. The modern kitchen is fully equipped and hosts us with a cozy outdoor lounge area ideal for enjoying the sunsets and sunsets in the spring and summer together with family and friends. The six bedrooms, all en suite, are equipped with the latest technology refined materials inspiring to the tranquility and relaxation, as well as the rest of the villa. This is the perfect place to enjoy a modern, luxurious and relaxed lifestyle in the Algarve.